Gordon is preparing an article on all the detailing he did to this car, particularly under the hood. In it, he'll describe how he modified a Replicas and Miniatures Company of Maryland distributor to fit underneath the "turkey roaster" (that big air deflector in front of the engine and between the tires. 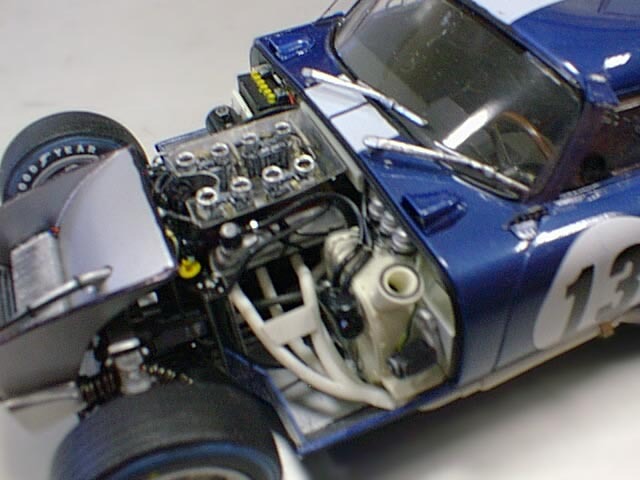 He'll also provide wiring, plumbing, and linkage diagrams that will help anyone accurately detail their own Cobra Daytona Coupe. He'll even describe how you can make brake scoops and detail the GoodYear Blue Streak tires.